Quick & Easy Vegan Comfort Food 65 Everyday Meal Ideas For Breakfast, Lunch And Dinner With Over 150... | Free eBooks Download - EBOOKEE! Posted on 2017-07-14, by everest555. Alicia C. Simpson, "Quick & Easy Vegan Comfort Food: 65 Everyday Meal Ideas for Breakfast, Lunch and Dinner with Over 150 Great-Tasting, Down-Home Recipes"
A born food-lover, raised in California on "the best Mexican food in the country" and her father's "traditional Southern soul food," Alicia C. Simpson couldn't imagine giving up her favorite dishes to become vegan. Animal-free food might be healthier, but could it match the tastes of home-like fried chicken, macaroni and cheese, or a bowl of chili? Three years after Alicia took the vegan plunge, Quick and Easy Vegan Comfort Food answers that question with a resounding "yes!" * 65 delicious combinations for breakfast, lunch, and dinner, with flavors from around the world, like "Chinese Take-In" or "Tijuana Torpedo"
* Everything you need to know to start your vegan pantry, and why being vegan is easier, less expensive, and more delicious than you might think. 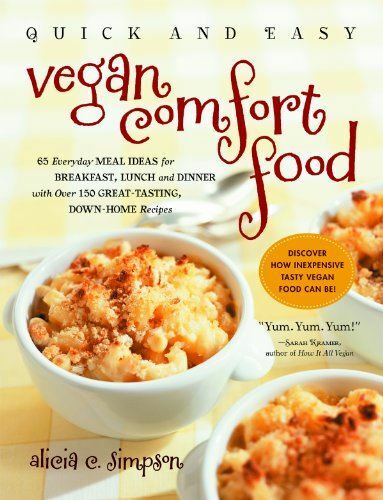 With spirit and style, Alicia shows just how easy-yes, and comforting-vegan food can be. No comments for "Quick & Easy Vegan Comfort Food 65 Everyday Meal Ideas For Breakfast, Lunch And Dinner With Over 150...".